The mourning ceremony to mark hte 25th anniversary of the passing of the late founder of the Islamic Republic, Ayatollah Seyyed Rouhollah Khomeini was held in Lebanon with Head of the World Forum for Proximity of the Islamic Schools of Thought, Ayatollah Mohsen Araki in attendance, reported Taqrib News Agency (TNA). The late founder of the Islamic Republic, Imam Khomeini passed away on June 4, 1989 at the age of 87. Touching the sad story, grief reigns supreme across Iran as the nation commemorates the 25th anniversary of the passing of the late founder of the Islamic Republic, Ayatollah Seyyed Rouhollah Khomeini. 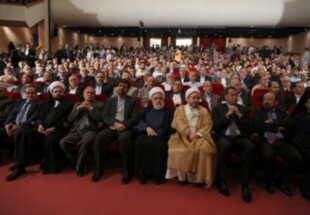 The event is not only marked in Iran, but also other counties hold commemorating to commemorate the sad even, paying tribute to the late founder of the Islamic Republic.